Have you ever wondered where your nurse is going when you see her dashing off with a box in her hands? She’s taking the dirty instruments to our dedicated decontamination room where they will be thoroughly cleaned and sterilised in accordance with the Department of Health HTM0-105 guidelines we adhere to. At the end of your appointment the nurse will place the used instruments in a clear sealed box. These are covered in a specialist disinfectant to keep them moist. Some things just can’t be sterilised because they have places that can’t be cleaned well. If that’s the case we use disposable items. These single use instruments are disposed of safely, in accordance with clinical and hazardous waste guidelines. 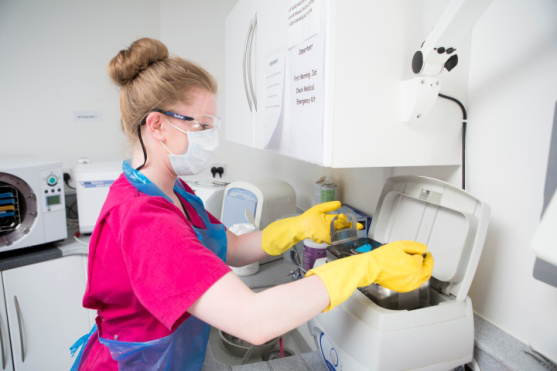 The dirty instruments are regularly taken to our decontamination room where they are thoroughly cleaned and sterilised to ensure they are safe for reuse. Before cleaning begins, the nurse working in the decontamination room (we call them the scrub nurse) has to put on her personal protective equipment (PPE). This includes an apron, face mask, eye protection and thick rubber gloves. The dirty instruments are then put in an ultrasonic bath containing disinfectant solution for 6-12 minutes. The ultrasonic bath is a machine that vibrates which helps to knock off any debris. Once this is complete the instruments are then scrubbed by hand and checked under a magnification lamp to ensure they look fully clean. We also check for any wear or damage. 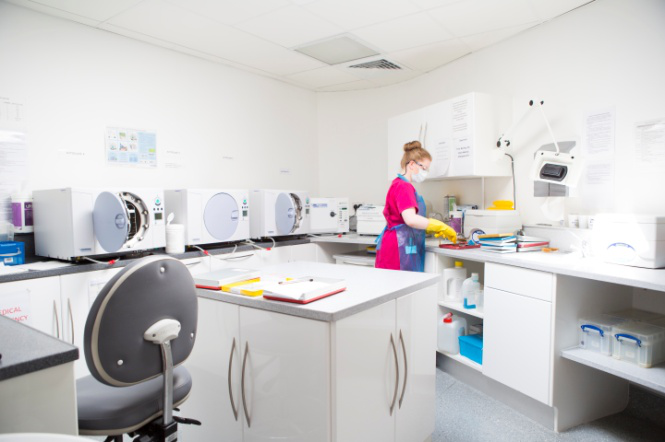 Once we are satisfied that the instruments are clean they are laid out on to special perforated trays and put into an autoclave for 20 minutes. An autoclave is a device that sterilises instruments by subjecting them to high pressure saturated steam. This pressurized steam reaches 134 degrees centigrade to kill any remaining bugs and germs. This process takes quite a while so the nurses have to be very organised to ensure we never run out of clean instruments! 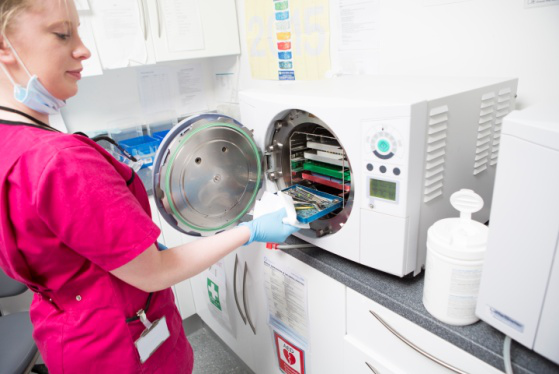 At the end of the autoclave cycle, the nurse will have removed her PPE used to clean the instruments and clean gloves and mask will have been put on. She will take them out of the autoclave, place them in the clean area, ensure they are dry and place them in a clean box ready to be taken back to the surgery. At the end of the day all of the instruments, whether they have been used or not, need cleaning and sterilising. Once they come out of the autoclave they get bagged up in special sterile pouches which are date stamped to ensure that all instruments are used within a year and are not stored too long between cycles. If they aren’t used within a year (even if the bag hasn’t been opened) they go back into the autoclave. All the machinery that we use to reprocess the instruments has to be tested daily, weekly, monthly and yearly and logs are kept for safety records. We are very proud of the smooth running of our decontamination room. What takes place in this room effects the running of the whole practice!